"In Mr. Driller, after a character is selected and a country is selected, the player then drills a seemingly endless onslaught of colored blocks, ending with that country's given mileage (given in meters.) The blocks can merge with other similarly-colored blocks, therefore disppearing after 4 or more blocks merge. There are 4 main colors of blocks: red, blue, green, and yellow. There are also 3 special kinds of blocks: white blocks, which are pale blocks that don't merge with other similarly-colored ones; crystal blocks, blocks that last for around a few seconds before disappearing; and X-blocks, brown crate-like boxes that take 5 drill hits to disintegrate, and also take off 20% of the player's air supply. The player has an air supply that acts as his/her vitality gauge, and when it is under 30%, the player's complexion will turn blue and a bubble with an air capsule will appear over his/her head. To keep the air from running out, the player can collect air capsules that replenish the driller's health by 20%. A life is lost when the player's air runs out, or if he/she is squished by falling blocks. The gameplay has been described as "Dig Dug meets Tetris."" 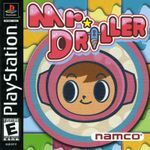 Source: Wikipedia, "Mr._Driller," available under the CC-BY-SA License.